We live such a busy life that sometimes our house isn’t quite as organized as I might like. It’s definitely a work in progress but recently I whipped my office/work area into shape with help from Duck Pack and Track! Read on to see how easy it is to use! It will change your organization game! 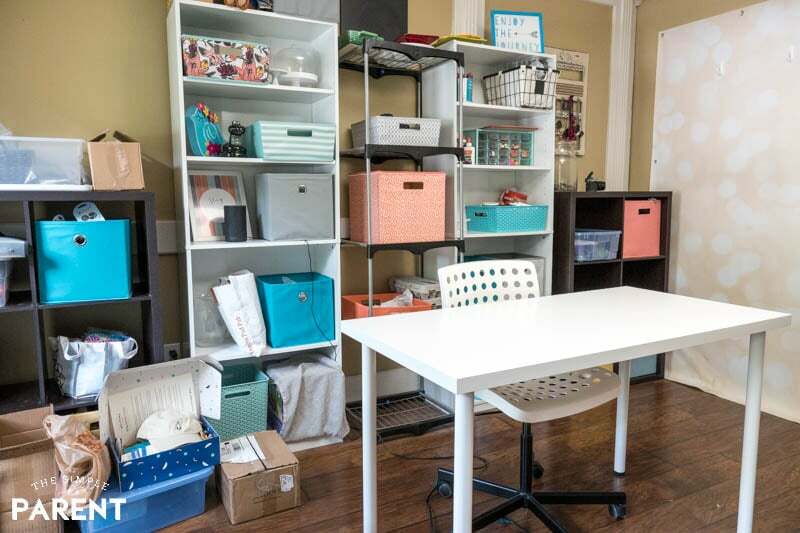 But first things first — check out how I got my work area cleaned up and more organized! Our formal dining room has served quite a few different uses over the years that we’ve lived here. Its current use is my workspace for the website. That means it houses a lot of different things! I’ve got the work table that I use for when I’m writing, when we’re crafting, for photography and even for video! It’s really an office and a workroom in one. I’ve got shelves to keep everything on but sometimes they get a little out of control because of the variety of things I keep on them. Office supplies – pens, pencils, scissors, tape, etc. 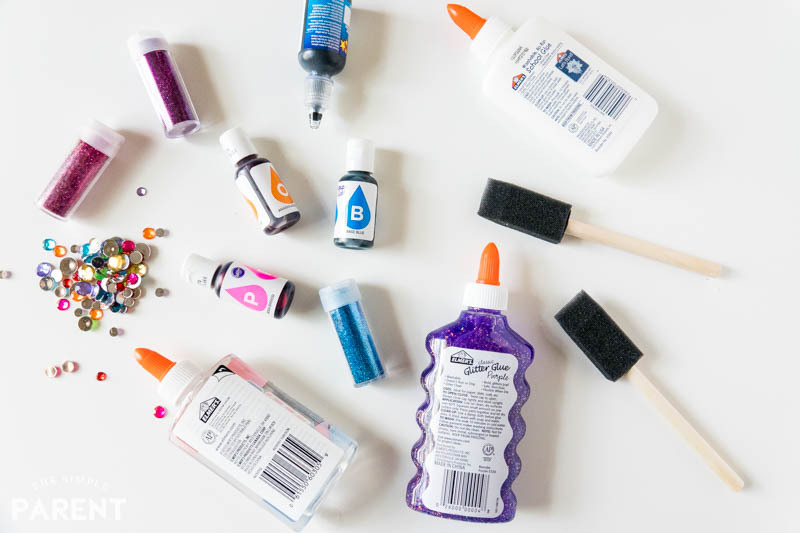 Craft supplies – all the fun stuff like our slime supplies and other things for when we get crafty. Decor – my framed inspirational quotes, pottery I painted, etc. My shelves were a jumbled mess, I had products all over the floor, some bins were overflowing and some were empty. To be honest, I had no idea what was in any of my bins! When it gets like this, it’s not the best work environment for me. While I’m not a neat freak by any means, I do work better when things are more organized. It was time for a change. I love the look of the fabric bins I use in the room but I spend a lot of time pulling them out to look through them because I have no idea what is in each one. There hasn’t been much organization in the way I use them. So when I had the chance to work with Duck Tape and their Pack and Track labels, inspiration hit! 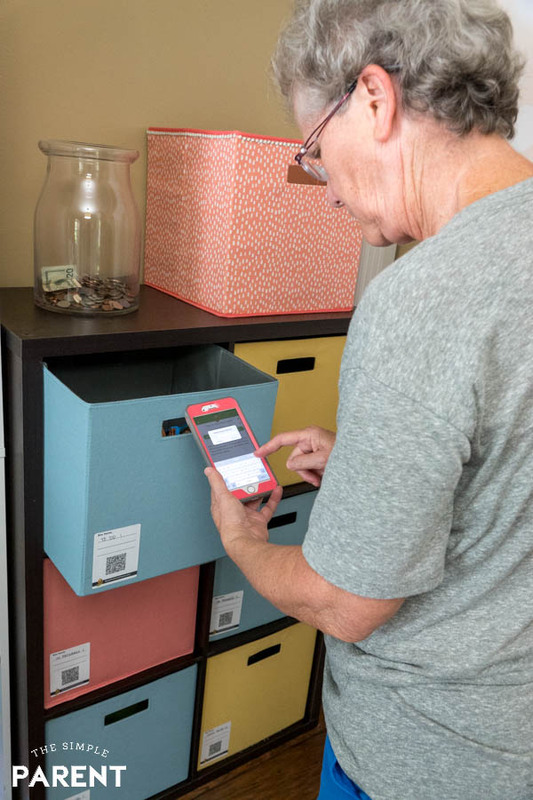 At first I thought they were meant for when you’re moving (and they would be brilliant for that) but they’re for any kind of organization project you can dream up! I’ve been eyeing them for all the holiday tubs we have in the garage, but I discovered that they worked great in my workroom! 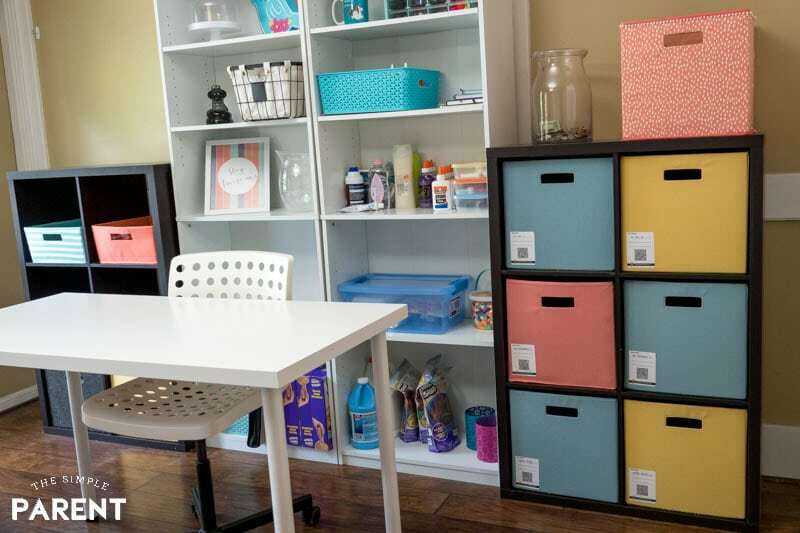 So if you have an office or a craft space, let me show you how they’re helping me keep things more organized! One of the things that I often struggle with when I’m trying to get things more organized around is making sure it’s a system that will work for more than a few days. If it starts to get too complicated, I can guarantee that it’s not something my family will keep up with. When the kids were little I tried organizing a bunch of bins for their toys. I started with very specific labels but toys still ended up all over the place. The labels that finally worked were very general in nature — blocks, cars, etc. I find that keeping things a bit more general is what works best for me too. So as Grambo and I cleaned up the room, we got rid of things we didn’t need and grouped things together to see what needed to be organized. It came down to a few different groups of items. I felt like if we could get all of those things more organized, the room would really work well for me. The craft supplies went onto the shelves and smaller containers for easy access when we’re using them. I wanted to use my larger bins for bigger items so they weren’t all over the room! That left all of the photo props that we use when we take photos, especially recipe photos. Plus, all of the products I have received for things I’m working on. The products usually fit into one of two groups — things to work on or things that are in progress. If a project is in progress, I never do anything with the product until everything is approved and I’ve completed all of the work. It can be a lot to keep around in one room! But with three rows of bins on my main storage shelf, I quickly came up with a plan that I thought was almost genius in its simplicity! Three rows of bins meant I had three ways to divide everything up! 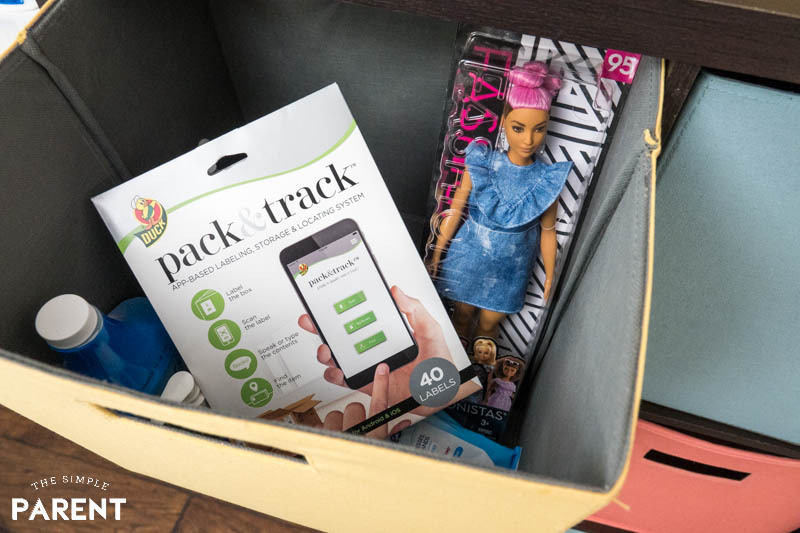 With Duck Pack & Track™ it’s easy to keep track of where you’ve put everything! 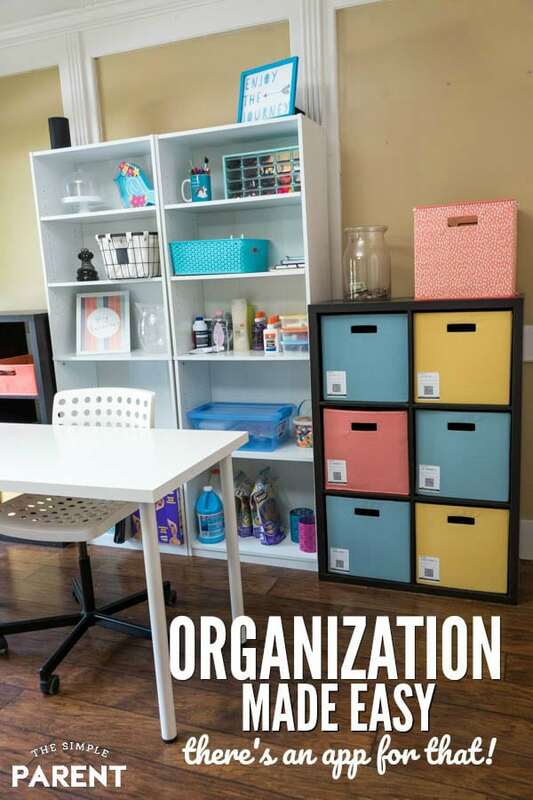 There are four easy steps to getting organized! Label your box or bin with a unique name. If you have more than one box that contains similar items you can use numbers. For example, I have Photo Props 1 and Photo Props 2. 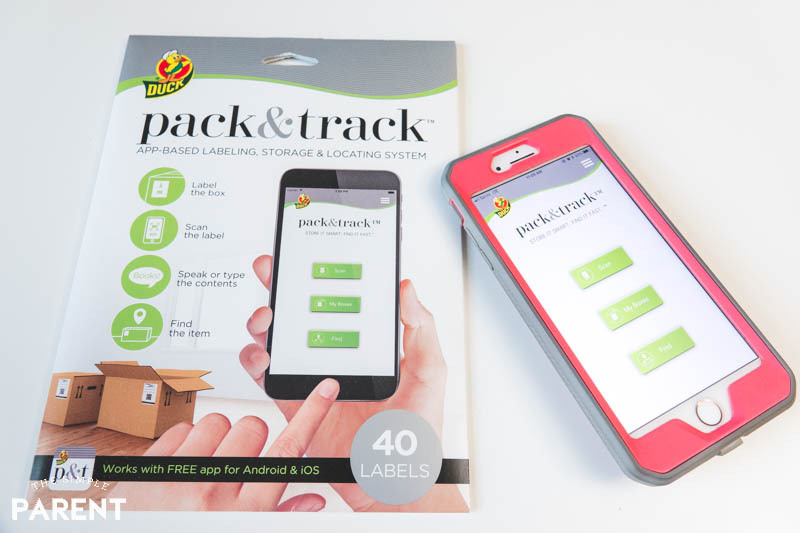 Download the Pack & Track™ app on your phone and scan the label. You can use your phone’s camera to scan the barcode on the label. Then you’ll be prompted to put in the name of your bin. Make sure it matches what you wrote on the label! Then start adding the contents to the list. You will be able to speak the items or type them using the keyboard. QUICK TIP: You can use the word and to add more than one item at a time. For example, “pots and cookie trays.” You just want to be sure to use words and phrases you will remember. When you’re ready to find an item, all you have to do is scan the label on the box again. The app will show you the full list of items in that box. Or you can use the FIND function on the app. Type in what you’re looking for and it will tell you which box it’s in! 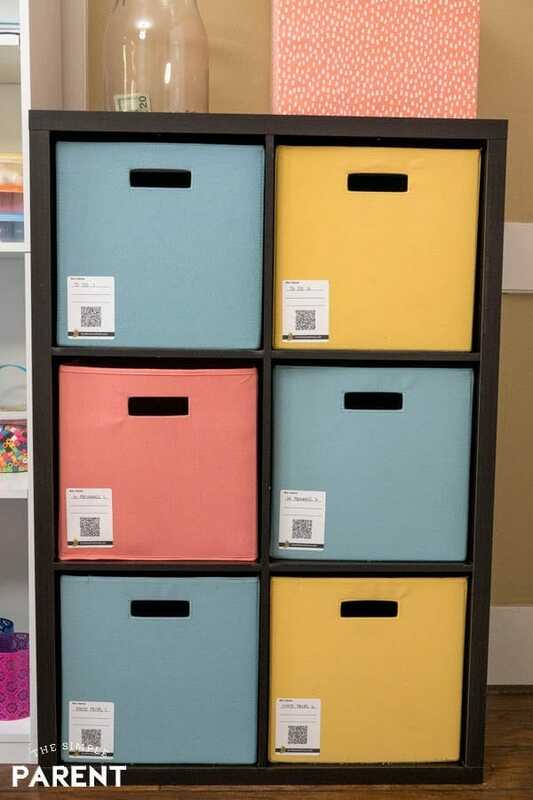 We created labels for each of our bins and organized all of the products that had been piling up on the floor into the first two rows based on what projects they’re being used for! Then we were able to fit a bunch of our photo props in their own bins. 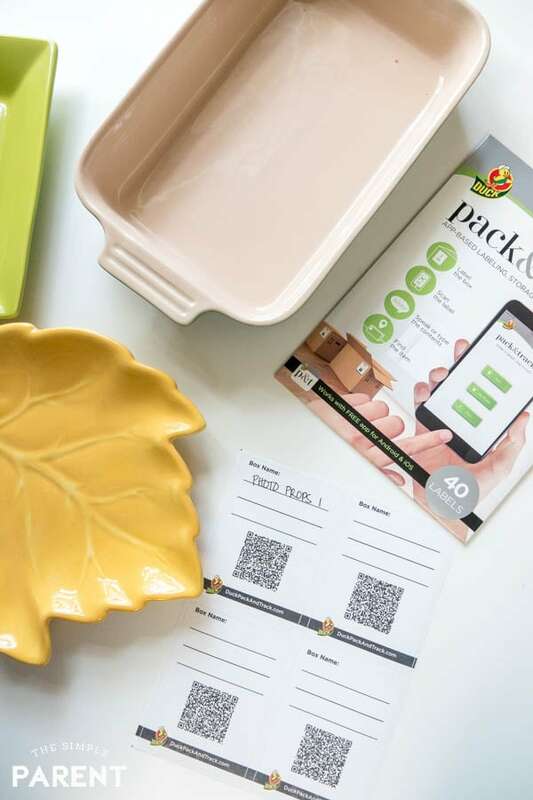 Next time we need a certain bowl or platter, it will be so easy to find using the Duck Pack and Track app! I’m so happy with how my workroom feels now! It feels organized in a way that I can manage. When new things come in the mail for work, they’re going right into their assigned bin! Now I’m ready to sit down and do more work! It’s amazing what cleaning up space and getting it more organized can do! It makes me want to spend more time there! Of course, my kids also seem to want to spend more time in there too! Good thing there is plenty of room for all of us now! Available nationwide at Walmart stores and for more information, check out the FAQs page. See how it works!